The annual ritual began a few weeks ago, but it¹s only now that the lumbering sea mammals are showing up in large numbers, and in locations easily accessible by tourists wanting to watch them. The whales are active and quite animated now, showing off for people watching by splashing and doing flips. The humpback whales are unique, with dorsal fins along their backs and ventral plaits running from the tip of the lower jaw back to the belly. Scientists who study the whales, which spend much of their year in the Aleutian Islands area off Alaska¹s coast, say the fins and plaits are as unique to whales as fingerprints are to humans. No two whales are alike. The humpbacks, which grow to 51 feet (16 meters) are part of a family of species that include blue whales, fin, minke, sei and Bryde¹s whales. Most are black, with a mottled black and white underbelly. The Kerama Islands, located less than 20 miles (30km) from mainland Okinawa, are the favored breeding area for the humpbacks, which begin showing up in January and stay in the area until late spring. The males provide much entertainment for spectators as they form groups, called mating pods, towage often fierce fights with each other as they vie for the females attention. Breeding follows in February and March, with births coming the following winter. Humpbacks are more people-friendly than other whale species, showing off by slapping dorsal fins on the water, blowing and doing Œspy hops¹ where they shoot straight out of the water and show their faces. Watching a mother and her young calves is a fantastic photo opportunity in the Keramas. 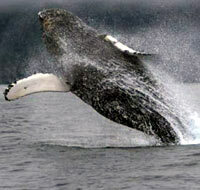 As spring turns to summer, the whales begin their migration north toward the Aleutians. Whale watching is easy, and it¹s fun. The best part is that whale watching can be accomplished in a couple different ways, depending on your sense of adventure. Whale watching tours are now going numerous times daily from both the Kerama Islands themselves, and from Naha, Ginowan City and Onna Village on Okinawa. There are also options for watching the whales from land, instead of on a rocking boat. The Zamami Whale Watching Society is responsible for many tours running through March, the peak of the whale watching season. The Society bills the whole whale season as the Zamami Village Whale Watching Festival, with two tours daily departing Zamami Port to cruise the waters in search of the humpbacks. The two-hour tours this year depart at 10:30am and 12:30pm. Tour cost is ¥5,000 for adults and ¥2,500 for children. Whale watching is fun, but a couple words of caution. If you are easily seasick, the best bet is to watch for whales from on shore. If you¹re on a boat, wear warm, waterproof clothing and shoes because the winds often make it feel cold. Remember too that whales are creatures, and not objects. Zamami officials say whales are seen about 80% of the time, but there are no absolute guarantees. If you choose to watch from the shore, the Whale Conservatory in Unazaki on Zamami Island is an option. The Conservatory is where the Society keeps a watchful eye out for whales. Another ashore site on Tokashiki Island is the Okinawa National Youth Center atop Mt. Akama. Dive shops and travel agencies in Zamami and Tokashiki, as well as Naha City, offer tour programs throughout February and March. Many tours begin from Naha Port. Tokashiki Company¹s three daily four-hour tours at 8:30 and 10:30am and 1pm, are ¥5,500 for adults and ¥4,500 for children. TROPICO¹s twice daily four-hour tours at 8:30am and 12:30pm trips are ¥3,980 for adults and ¥2,500 for kids. Okinawa Tourist Service runs a Zamami Island day trip, including express ferry at 9am and regular ferry at10am. The eight-hour express ferry trip and seven-hour regular ferry trips are ¥7,300 for adults and ¥5,800 for kids. Aka Island express and regular ferry trips also run at 9am and 10am, with tickets ¥8,000 for adults and ¥7,000 for children. daily tours running three or four hours. Manza Beach Hotel¹s three-hour 9am and 1:30pm tours are ¥7,350 for adults and ¥5,250 for kids, while Tokashiki Company¹s 8:30am and 1pm four-hour tours are ¥5,500 for adults and ¥4,500 for children. Contact also MCCS Tours Plus or Kadena ITT for information on bases. Watching the whales, which consume 1-1.5 tons of fish and krill a day, offers good photo opportunities. Zamami Whale Watching Society also has literature, photographs and post cards, and souvenirs available.